The great thing is that they offer a demo, so you can try the experience before you buy. Quote Munch is now available to try on Linux systems using the SteamVR for Linux beta release. Both the full game and the demo is available, but beware that due to the staggering amounts of beta software used to develop and play VR on linux, this is an experimental release and we give no guarantees that it will work on your system. This is also the reason why the store page won't list Linux and SteamOS as a supported platform. They emailed me directly about it stating they knew I didn't have a Vive, but they said anytime I do get one they will be happy to give me a key. It's not only nice to be offered a key, but great to see a developer pay attention to what I actually write up here. I like these developers already. 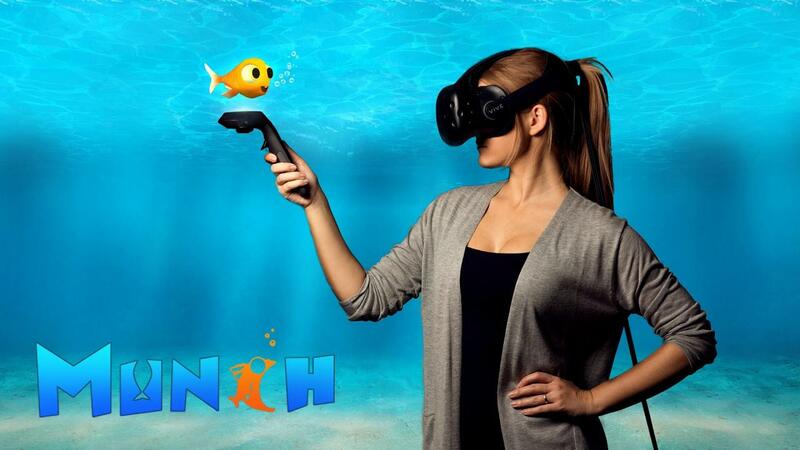 Munch is a game that virtually anyone can enjoy. It's as easy to learn as it is challenging to master, and will always keep you on your toes as you wrestle through the waves. Challenge your friends to a watery showdown and see who ranks highest on the leaderboards! Looks like a pretty fun little game utilizing room scale well. The concept reminds me of slither.io. Well, handling it with refunds is okay with me if they don't start rejecting your refund requests because of testing whether VR titles makes you feel sick... Oculus doesn't even offer refunds which is really stupid when we're talking about VR.